Perfect for any wedding or event! Available in almost any colors! The glitter pocket is heavy cardstock paper and has glitter on the entire back and inside. The glitter can come in either gold, silver, black, pink and a few other colors. This is for the glitter picket wraps ONLY! The additional shown items such as ribbon, embellishments, envelopes and other cards are sold separately by contacting us. 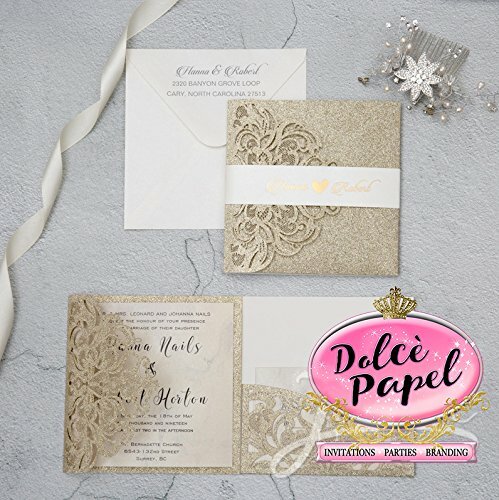 If you have any questions about this product by Dolce Papel Invitations, contact us by completing and submitting the form below. If you are looking for a specif part number, please include it with your message.